We carefully navigate the icebreaker to precisely 90 degrees north for our champagne toast of this momentous accomplishment. We ceremoniously drop the anchor on a sturdy stretch of ice and disembark onto the frozen sea. You are now able to stand at the top of the world. Welcome to the city of Murmansk on Russia’s Kola Peninsula, starting point of our adventure. 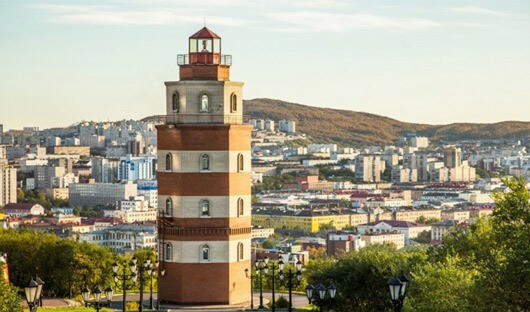 Upon your arrival at Murmansk airport you are met and transferred to your hotel, which is included in the price of the voyage. The Russian name of the vessel 50 Let Pobedy translates to 50 Years of Victory. 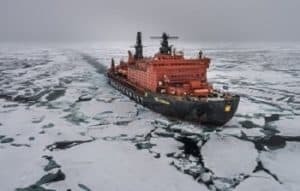 The ship is powered by two nuclear reactors generating 75,000 horsepower and capable of crushing a clear path through multi-year ice up to three meters thick, she is the largest and most powerful icebreaker ever built. Today a group transfer takes you to the port where you are welcomed aboard the nuclear-powered icebreaker 50 Years of Victory. You’ll have time to explore the ship and get orientated as she slips her moorings and sail north out of Kola Bay. Nowhere can it be more truly said that “getting there is half the fun”. As you cruise northward through the Barents Sea there is always the possibility of seeing whales. 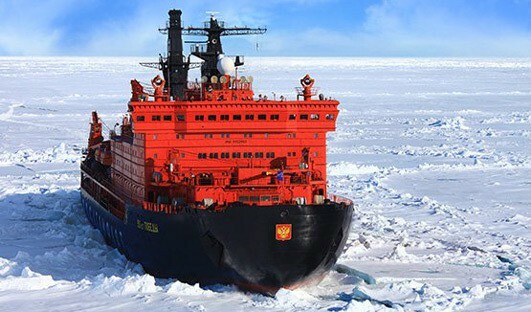 Meanwhile, you have the opportunity to learn about the unique icebreaking capabilities of the ship. You are also treated to a tour of the engine room – which given the ship’s engine is a nuclear generator – it’s no standard ‘engine room’. 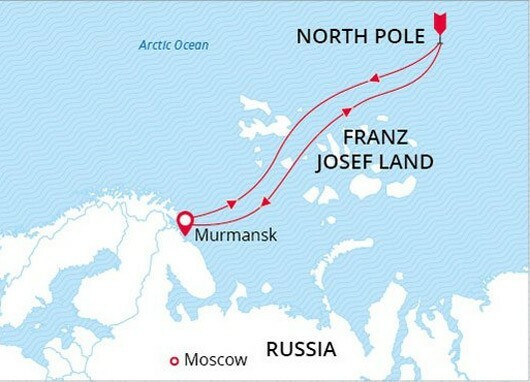 The North Pole is a little over 2,300 km from Murmansk. As you make our way across the ice cap, you witness firsthand the ship’s awesome power as massive ice blocks give way under the enormous bulk of the spoon-shaped bow. 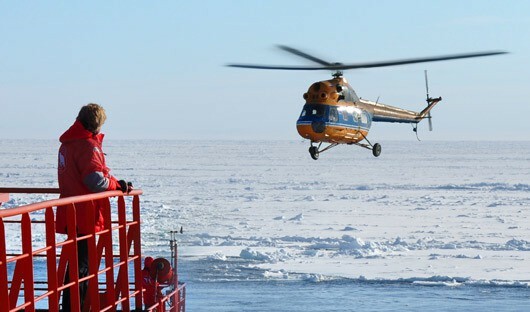 The ship’s crew also take advantage of 24-hour daylight to offer you helicopter flightseeing tours. From the air you can observe the ship crushing a path through the ice. You also have a unique vantage point from which to witness the stunning beauty of this vast polar icescape. 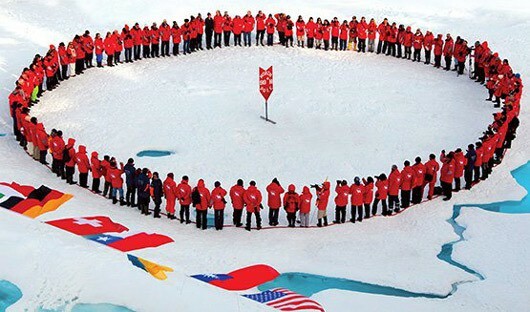 Welcome to the geographic North Pole! 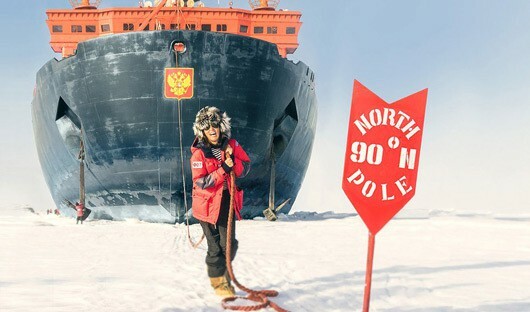 After carefully navigating to 90 degrees North the 50 Years of Victory drops the anchor on a sturdy stretch of ice and you disembark onto the frozen sea at the Top of the World! Join hands with your fellow passengers and literally walk around the world during our special International Round Dance. You are also treated to a barbeque out on the ice. You may even have the chance to take a plunge into the icy water! After your memorable time at the North Pole we turn around and head south. But the adventure is not over yet. The High Arctic archipelago of Franz Josef Land is still to come! The Franz Josef Land archipelago (a group of 191 islands), is part of the Russian Arctic National Park. 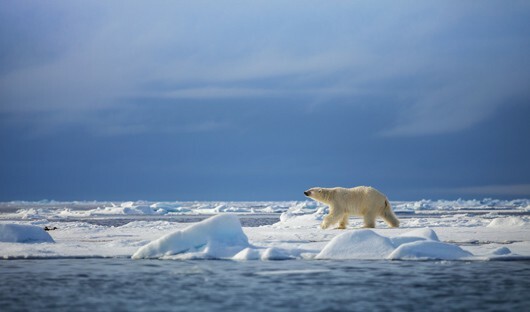 Polar bears, walruses, beluga whales and for the very fortunate narwhal or Bowhead whales—can be spotted anytime, anywhere in and around Franz Josef Land. The cliffs and scree slopes around the islands host enormous colonies of migratory seabirds such as guillemots, little auks, and ivory gulls. Taking advantage of 24-hour daylight every opportunity for wildlife viewing is utilised for excursions via Zodiac and helicopter. 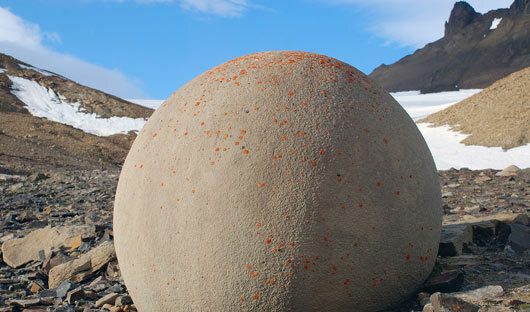 Franz Josef Land is home to some interesting geological features, such as the mysterious stone spheres on Champ Island. 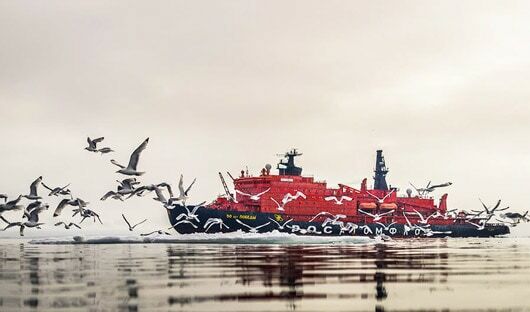 After your amazing time in Franz Josef Land the 50 Years of Victory crosses back south through the bountiful waters of the Barents Sea. Presentations and workshops by the expert staff ensure that these days at sea are not idly spent. You may also take advantage of onboard facilities and amenities such as a polar library, volleyball court, gym, two saunas, warm seawater pool, gift shop, and massage treatments. Seabird viewing and whale sightings can be enjoyed from panoramic open decks as well as exterior stateroom windows.museum of natural and exploration history. After breakfast on board we say farewell to the 50 Years of Victory and Murmansk. A transfer is provided to the airport or to the city centre, depending on the time of your flight to Moscow. 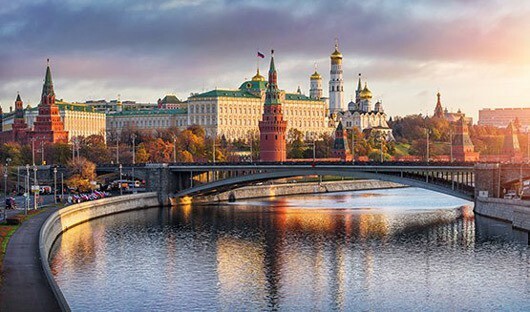 The voyage prices includes one hotel night in Moscow. After breakfast (included with your hotel stay) you are free to make your way back to the airport or to extend your stay in Moscow. Letter of Invitation. This document should be presented to the Russian Consulate in your area in order to obtain a Russian Visa. Please, contact the Russian Consulate to learn more about the procedure for obtaining a Russian Visa. International flights to Murmansk. We will arrange flights to and from Murmansk (via Helsinki and home via Moscow). We will look after all aspects your journey to the Top of the World.